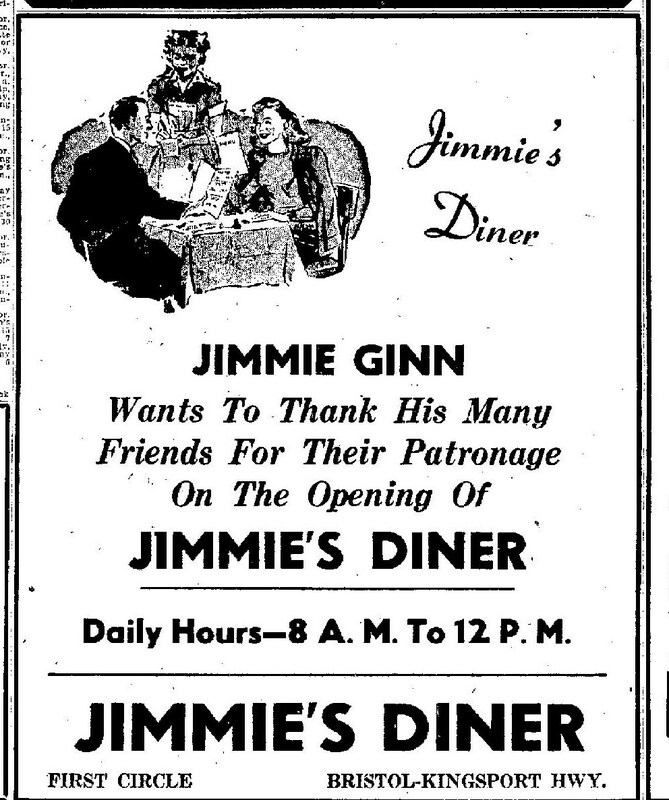 This ad ran in 1945 when Jimmie's opened as Jimmie's Diner. 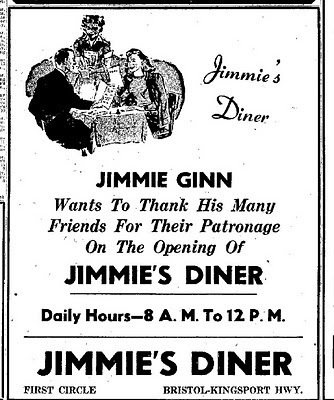 This ad ran in 1947 when a remodeled Jimmie's reopened as Jimmie's Steak House. 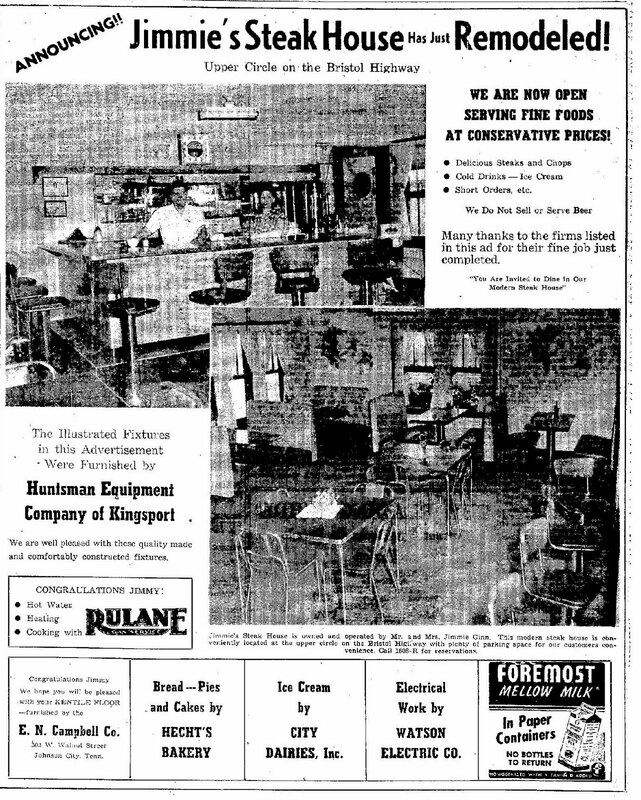 This ad appeared in the Kingsport Times News on July 28, 1954. 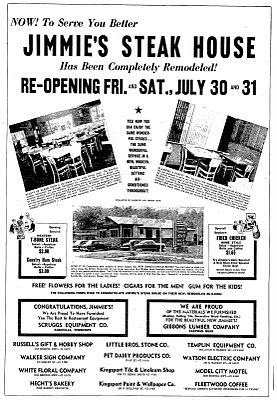 This is what the place looked like when Elvis and Kingsport girl Billie Mae Smith dined there after his Civic Auditorium performance. What if Jay Leno and David Letterman were brothers? And what if they told the same jokes? Meet the Spivey brothers, Don and Rick. They're not comedians - well, Don isn't anyway - but they are rivals going head-to-head two or three times a week and using the same material. 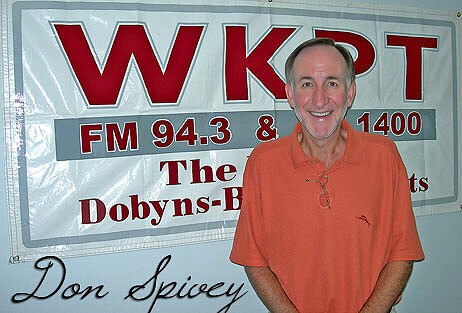 Don broadcasts Dobyns-Bennett basketball games on WKPT-AM; Rick for WKIN-AM. They broadcast the same games at the same time. Different brothers, different stations, different approaches, same games. And that's games plural: D-B football, basketball and baseball games, home and away, regular season and playoffs and tournaments. There are high school basketball teams all over the country begging a local radio station to broadcast their games - believe me, my son played on one in Kentucky. In Kingsport, the local high school has an abundance of radio coverage, and it comes on competing stations, and features competing brothers. What is it they say about sibling rivalry? It started with Cain and Abel. 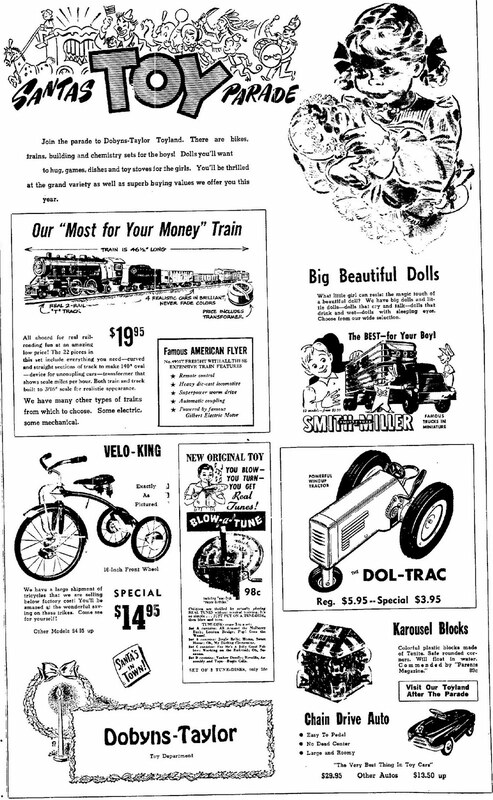 But it hasn't gotten to fratricide yet, and the Spivey brothers insist it won't. "We are not competitive at all in this," says Don. No sibling rivalry, Rick agrees. "Not in this anyway." 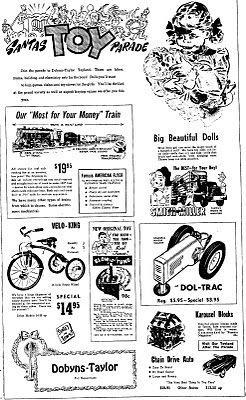 "I do it totally different," says Don. "He does color. I'm not very colorful." Don is in his second year calling D-B basketball. Rick is the veteran of the two. He has teamed with Tom Taylor for the past 14 years, providing commentary on D-B athletic contests. And that's the big difference: Rick does color, Don does play-by-play. The Spivey brothers are Kingsport natives. Rick graduated from D-B in 1969, went on to Carson Newman and Cumberland Law School. Don graduated from D-B in '73 then got a degree from ETSU. Don has been in the insurance business 22 years, currently with BB&T/KDC. Rick is well-known locally as an attorney. They had pretty much been going their own ways - one in insurance, the other in law - until a little over a year ago when WKPT asked Don to take over its basketball broadcasts. "I had been the public address announcer for D-B football for I don't know how many years. But this was just something I wanted to try. It was truly a leap of faith." 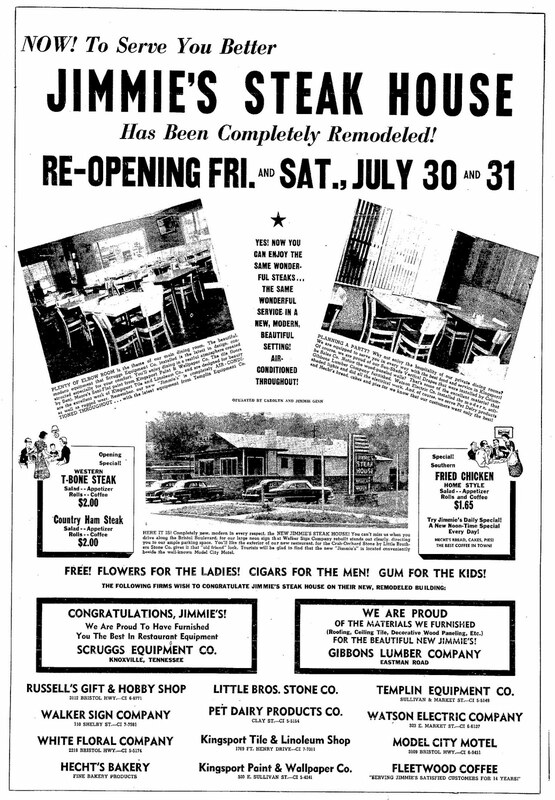 Don's current partner is Steve Kilgore, a former Gate City High School athlete. Eddie Durham had been the color man until a month ago, when he had to return to coaching. Rick has been working alongside Tom Taylor for all of his 14 years. If Don doesn't do color, then Rick is all color. And on an occasion or two, a little off-color. "A few times I have been overexuberant," he admits. The story everyone tells on Rick doesn't involve a broadcast. It's about a broadcast he missed. He even tells it on himself. "It was the Science Hill game. I went to the rest room, and they locked the door on me and nobody could find me. I stayed in there from the beginning of halftime till the middle of the last period." Tom Taylor remembers a time he maybe wished Rick had been locked in the bathroom. "It was the girls' state tournament. We were playing Beech, which was really good, and it was like David versus Goliath. But D-B was ahead after three quarters. Holly Harwood comes down and makes a shot, and Rick pumps his fist, ‘Yes! Yes!' You weren't supposed to cheer on press row. They tried to throw us off, but I talked them into letting us stay." And then there was the time Rick brought the wrath of a fan down on the WKIN team. 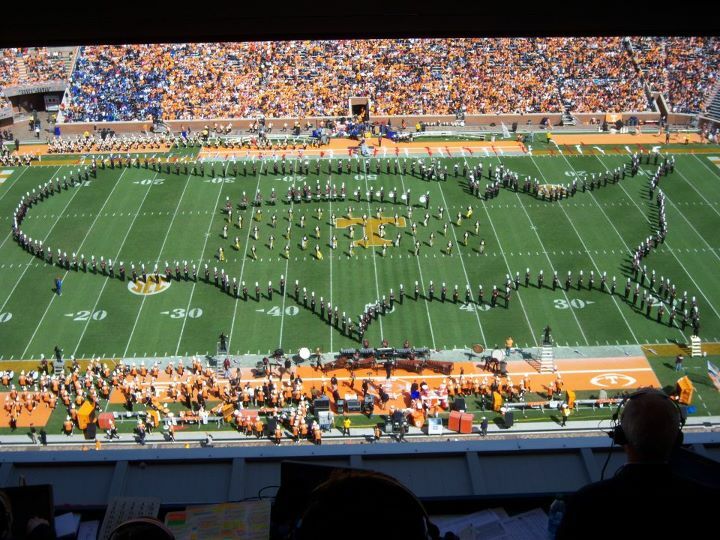 It was at Heritage, and Rick had been flipping his cigarettes out the press box door. Unbeknownst to Rick the Quarterback Club was cooking up hamburgers and hot dogs down below. The next thing Taylor knew a wild-eyed fan was racing up the stadium steps toward the press box door with his shirt on fire. "Rick was at the other end of the press box. He saw the guy coming, and he just stayed down there. Meanwhile this guy wants to whip me and I'm trying to broadcast a game." Cooler heads eventually prevailed. There are no stories like that about Don because, well, Don is Don and Rick is Rick. Same job, different brothers. Both say they love their second jobs. Rick adds: "This has been one of the better experiences of my life. Very stress-relieving. And I'm not paid to do this. It's strictly for the kids." You have to admit, it is unusual, a town Kingsport's size, with competing radio stations broadcasting local high school sports. And with competing brothers. Rick says the Oak Ridge fans always jeer D-B's TWO radio stations. But Rick says, "It's a tradition of Kingsport sports. People support us passionately." Except ones with their shirts on fire.